Kalank (transl. Stigma; Hindi pronunciation: [kələnk]) is a 2019 Indian Hindi-language period drama film directed by Abhishek Varman and produced by Karan Johar, Sajid Nadiadwala and Fox Star Studios. It stars Madhuri Dixit, Sonakshi Sinha, Alia Bhatt, Varun Dhawan, Aditya Roy Kapur, Sanjay Dutt. It is a period drama set in 1945 in the pre-independence British era. Principal photography of the film began in April 2018 and was released on 17 April 2019 on 5300 screens worldwide making it the widest Bollywood release of 2019 as yet. The opening day domestic collection of the film is ₹21.60 crore, which is the highest opening day collection for Bollywood films released so far in 2019. Satya Chaudhry, a woman dying of cancer, requests her childhood acquaintance, Roop, to provide companionship to her husband, Dev. Roop agrees on the condition that she marry Dev. Once married, Dev tells Roop that their relationship will be cordial and platonic. A depressed Roop takes solace in music, which she begins learning from the madam of a brothel, Bahaar Begum. She also begins working in her husband's publishing house. Roop expresses interest in writing about the condition of the locality in which the brothel is located, during which she interacts with a womanising blacksmith named Zafar. Zafar wants to exact revenge on his parents, Bahaar Begum and Balraj Chaudhry (who abandoned Zafar after Balraj ended his extramarital affair with Bahaar) by seducing Roop, as she is married to Balraj's legitimate son, Dev. Roop misconstrues Zafar's intentions and falls in love with him. She also begins to develop a friendship with Dev, to Satya's pleasure. Satya dies after urging Dev to give Roop a chance and to forgive Balraj for his affair. In another effort to humiliate Balraj, Zafar instigates communal hatred in his friend, Abdul, by demanding for the partition of India on religious lines, which Balraj and Dev do not support. When Balraj becomes aware of Roop and Zafar's affair, he confronts Bahaar Begum and Zafar. Bahaar, who disagrees with Zafar's approach, warns Roop. Heartbroken, Roop consummates her marriage with Dev, but insists that she would never be able to love him. As Abdul Khan's political stance gains leverage, riots against Hindus and Sikhs in the city take place, during which the Chaudhry's decide to flee to Amritsar with the help of Zafar, but not before Saroj, the benevolent maid, is brutally stabbed to death. He confides in Roop that he eventually fell in love with her, despite his early intention. While boarding a train, Zafar is murdered by Abdul, as Roop and Dev escape. Ten years later, Roop and Dev, still in a loveless marriage, are interviewed about their experience by Aditya, a journalist documenting the partition. The film was conceptualised by Johar and his father Yash Johar around fifteen years ago. Actress Sridevi was initially signed for the character role played by Madhuri Dixit. Production designer Amrita Mahal was brought onboard to work on the set’s design and structure that represented old Delhi mohalla with a mahal in Film City, Mumbai. Sajid Nadiadwala, owner and producer of Nadiadwala Grandson Entertainment and Karan Johar were present during the clap shot of Kalank. The cost estimate of the set was reportedly ₹15 crore. Sajid Nadiadwala and Sanjay Dutt come together after 24 years with Kalank. Principal photography commenced in Film City, Mumbai on 18 April 2018. Madhuri Dixit and Aditya Roy Kapur joined the cast from 31 May 2018. Filming of an introductory song featuring Varun Dhawan, Alia Bhatt and Kiara Advani with nearly 500 backup dancers was completed on 7 May 2018. Rehearsals for a second dance number featuring Dhawan, Kapur and Kriti Sanon began on 31 May 2018. On 2 June 2018, a few leaked stills from the film showed Dixit donning an anarkali outfit and pasa/jhumar (hair jewellery). Sonakshi Sinha joined the cast from 14 June 2018 for a fifteen-day filming schedule. She is paired opposite Kapur in the film. The third schedule of filming was postponed due to injuries to Bhatt, Dhawan and Kapur and was rescheduled to commence two weeks later.. Sonakshi Sinha has finished filming her part in Kalank. Alia Bhatt announced the film wrapped on 19 January 2019. The music of the film is composed by Pritam while lyrics are written by Amitabh Bhattacharya. In a series of first look posters characters of the film were revealed on 7 March 2019. It presented the male lead actors of Kalank Varun Dhawan as Zafar, Aditya Roy Kapur as Dev Chaudhry and Sanjay Dutt as Balraj Chaudhry. On 8 March 2019 to coincide with the International Women's Day characters in the film of Alia Bhatt as Roop, Sonakshi Sinha as Satya Chaudhry and Madhuri Dixit as Bahaar Begum were revealed. The official teaser of film was released on 12 March 2019 by Fox Star Hindi. It recorded forty million views since its release. The official trailer of the film was launched on 3 April 2019 by Dharma Productions. It fetched more than 24 million views since its release on YouTube. The first song of the film "Ghar More Pardesiya" was released on 18 March 2019 and the second one "First Class" was released on 22 March 2019. The title track released on 30 March 2019. The fourth song "Tabah Ho Gaye" featuring Madhuri Dixit was released on 9 April 2019. The song has usual characteristics of Dixit. It is sung by Shreya Ghoshal and liked by the audience. The fifth song of the film "Aira Gaira" was released on 13 April 2019. The film was scheduled for release on 19 April 2019, but to get benefits of extended weekend the release date has been changed to 17 April 2019. A special screening of the film was organized for selected audience on 14 April 2019 prior to its release. Kalank was certified by British Board of Film Classification and Australian Classification Board with runtime of 166 minutes and was released worldwide on 17 April. The film was released on 5300 screens worldwide making it the widest Bollywood release of 2019 as yet. Raja Sen calls it "..an opera that needed a stout songstress to warble through it midway." Rachit Gupta of Times Of India finds, "Kalank a true labour of love that tells you a story laced with beautiful moments that will tug you at your heartstrings." Praising the acting of ensemble cast he rates it with three stars out of five. Taran Adarsh rates the film with two stars out of five and though praised the star cast for their acting he finds the film 'disappointing'. Writing for NDTV Saibal Chatterjee praises Madhuri Dixit and Alia Bhatt for their screen presence and concludes long review as, "Kalank has unmistakable contemporary resonance because it celebrates the transformative power of love and reconciliation in a time of rampant discord. It is worth a viewing not only for what it says, but also for how it says it." Writing for The Indian Express Shubhra Gupta gives it one and half star out of five and says, "Kalank doesn’t really lift off the screen. The whole feels like a giant set, stately and ponderous and minus impact; the characters all costumed and perfumed and largely life-less, sparking only in bits and pieces." Raja Sen writing for Hindustan Times rated the film with two and half stars out of five and praised Varun Dhawan, Alia Bhatt and Madhuri Dixit for shining in stunning but soulless film. He feels that 'it is a stunningly plated meal, but needed salt.' He says, "Directed by Abhishek Varman and shot by the masterful Binod Pradhan, the makers of Kalank not only want every frame to be a painting, but every dialogue a proverb, every scene a portent. The result is beautiful but tedious, an opera that needed a stout songstress to warble through it midway." Nandini Ramnath writing in the Scroll.in points out that the movie glamorized the partition by replicating kitsch aesthetic, and added, “The sets that are meant to enhance the big-screen experience end up creating a distance from the messiness of the emotional conflicts.” Anupama Chopra of Film Companion rating it with three stars out of five opines that Kalank is likely to be the most visually stunning film of this year. She says, "The film is an operatic fantasy filled with staggering sets, swirling fabric and heartache, but to enjoy it, you must wholly suspend disbelief." Kalank's opening day domestic collection is ₹21.60 crore. This is the highest opening day collection for Bollywood films released so far in 2019. From overseas markets it grossed ₹34.70 crore and from domestic circuit ₹78.61 crore. The overall worldwide gross is ₹113.31 crore as of 21 April 2019[update]. ^ Panchal, Komal Rj (12 March 2019). "Karan Johar: Kalank is a labour of love". The Indian Express. Retrieved 28 March 2019. ^ Mathur, Kajol (23 April 2018). "Here's an interesting update from Varun Dhawan on Kalank". Filmfare. Retrieved 15 June 2018. ^ a b c Taran Adarsh [@taran_adarsh] (9 March 2019). "IT'S FINAL... #Kalank to release on 17 April 2019 [was slated for release on 19 April 2019 initially]... Will be a 5-day *extended* opening weekend... Teaser will be out on 12 March 2019" (Tweet) – via Twitter. ^ "Kalank". British Board of Film Classification. Retrieved 13 April 2019. ^ Dogra, Tavishi (2 February 2019). "Bollywood goes big on budget! Here are the top mega budget upcoming movies of 2019". The Financial Express. Retrieved 18 February 2019. ^ a b c "Kalank Box Office". Bollywood Hungama. Retrieved 22 April 2019. ^ a b "Bollywood Top Grossers Worldwide Bollywood Hungama". Bollywood Hungama. Retrieved 22 April 2019. ^ "Kalank: Madhuri-Sanjay To Reunite On Screen Along With Alia, Varun, Sonakshi and Aditya". CNN-News18. 18 April 2018. Retrieved 18 April 2018. ^ "Kalank: Varun-Alia, Madhuri-Sanjay to share screen space in Karan Johar's next". The Indian Express. 18 April 2018. Retrieved 18 April 2018. ^ Basu, Nilanjana. "Kalank Trailer: Alia Bhatt's Self-Destructive Quest For Illicit Love With Varun Dhawan". NDTV. Retrieved 3 April 2019. ^ a b Taran Adarsh [@taran_adarsh] (17 April 2019). "#Kalank screen count... India: 4000 Overseas: 1300 Worldwide total: 5300 screens* #Kalank is the widest release for Varun Dhawan and Alia Bhatt. *Also, #Kalank is the widest release of 2019 *so far*. *#MahaveerJayanti [Wed] and #GoodFriday [Fri] holidays will boost biz" (Tweet) – via Twitter. ^ "She would walk alone in darkness than follow anyone else's shadow. Bahaar Begum✨@MadhuriDixit #WomenOfKalank #Kalank". Twitter.com. Retrieved 8 March 2019. ^ "She symbolises the elegance & grace of a woman. Presenting Satya. @sonakshisinha #WomenOfKalank #Kalank". Twitter.com. Retrieved 8 March 2019. ^ "Resilient at heart but everyone has a chapter they don't read aloud. Here's Roop! @aliaa08 #WomenOfKalank #Kalank". Twitter.com. Retrieved 8 March 2019. ^ "Fate loves the fearless and he's the most favoured. Presenting Zafar!#MenOfKalank#Kalank @Varun_dvn". Twitter.com. Retrieved 7 March 2019. ^ "A sprinting mind with a noble heart. Presenting Dev Chaudhry. #MenOfKalank #Kalank #AdityaRoyKapur". Twitter.com. Retrieved 7 March 2019. ^ "The head of the table with a formidable iron fist. Presenting Balraj Chaudhry. #MenOfKalank #Kalank @duttsanjay". Twitter.com. Retrieved 7 March 2019. ^ "Kunal Kemmu Clamps Cast Of Karan Johar's Multi-Starrer Kalank". Mid Day. 1 May 2018. Retrieved 13 May 2018. ^ a b "Kalank Movie Review". Bollywood Hungama. 17 April 2019. Retrieved 18 April 2019. ^ Coutinho, Natasha (21 June 2018). "Hiten Tejwani to feature with Alia Bhatt, Aditya Roy Kapur in Kalank". Mumbai Mirror. Retrieved 21 June 2018. ^ "'Kalank' song 'First class' stills: Varun Dhawan and Kiara Advani make us want to celebrate Jumma". Daily News and Analysis. 22 March 2019. Retrieved 22 March 2019. ^ "Kalank song Aira Gaira teaser: Kriti Sanon to groove with Varun Dhawan, Aditya Roy Kapur in this new dance number". Hindustan Times. 12 April 2019. Retrieved 13 April 2019. ^ "Kalank movie announcement highlights: Madhuri Dixit and Sanjay Dutt to share screen space after 25 years". The Indian Express. 18 April 2018. Retrieved 16 June 2018. ^ "Karan Johar's Kalank Stars Madhuri Dixit, Sanjay Dutt And Many Others. Sridevi, You'll Be Missed". NDTV.com. Retrieved 16 June 2018. ^ "Madhuri Dixit replaces Sridevi in KJo's upcoming film 'Kalank' - The Express Tribune". The Express Tribune. 18 April 2018. Retrieved 16 June 2018. ^ a b "Kalank: Karan Johar recreated Old Delhi in Mumbai but it cost him a fortune". The Asian Age. 26 April 2018. Retrieved 16 June 2018. ^ "As Karan Johar's Kalank begins filming, pictures and updates from first day on set". Retrieved 1 October 2018. ^ "Sajid Nadiadwala and Sanjay Dutt come together after 24 years with Kalank". Bollywood Hungama. 15 April 2019. Retrieved 15 April 2019. ^ "As Karan Johar's Kalank begins filming, pictures and updates from first day on set". Retrieved 16 June 2018. ^ "Madhuri Dixit begins shooting for Kalank". The Asian Age. 28 April 2018. Retrieved 16 June 2018. ^ "Karan Johar gatecrashes Kalank dance rehearsal; Fawad, Mahira Khan on magazine cover: Social Media Stalker's Guide- Entertainment News, Firstpost". Firstpost. Retrieved 16 June 2018. ^ a b Coutinho, Natasha (31 May 2018). "Kalank: Kriti Sanon to grove with Varun Dhawan, Aditya Roy Kapur in a special song". Mumbai Mirror. Retrieved 31 May 2018. ^ "Varun Dhawan, Alia Bhatt shoot for the first song in Karan Johar's Kalank with 500 back-up dancers". Retrieved 16 June 2018. ^ Hungama, Bollywood (30 May 2018). "LEAKED! Madhuri Dixit's look as a courtesan from the sets of KALANK - Bollywood Hungama". Bollywood Hungama. Retrieved 16 June 2018. ^ "Sonakshi Sinha joins 'Kalank' cast after wrapping 'Happy Phirr Bhaag Jayegi' shoot". Deccan Chronicle. 14 June 2018. Retrieved 16 June 2018. ^ "Sonakshi Sinha joins Aditya Roy Kapur in Abhishek Varman's Kalank - Mumbai Mirror -". Mumbai Mirror. Retrieved 16 June 2018. ^ "Kalank: Looking forward to pair up with Aditya Roy Kapur for the first time, says Sonakshi Sinhha - Mumbai Mirror -". Mumbai Mirror. Retrieved 16 June 2018. ^ Darade, Pooja (26 July 2018). "Kalank: Varun Dhawan and Alia Bhatt's film's 3rd schedule gets postponed; find out why". pinkvilla.com. Retrieved 30 July 2018. ^ "Sonakshi Sinha completes filming her part in Kalank, posts photo that speaks a thousand words - check it out - Bollywood News". www.timesnownews.com. ^ "Alia Bhatt is all smiles after wrapping last schedule of Kalank. See pics". www.indiatvnews.com. 19 January 2019. ^ "Kalank - Original Motion Picture Soundtrack". Jio Saavn. ^ "Varun Dhawan's look from Kalank REVEALED! A kohl-eyed Zafar looks ready to flirt with life and danger". Times Now News. Retrieved 7 March 2019. ^ "Kalank New Poster: Meet Aditya Roy Kapur as virtuous Dev Chaudhry". India TV News. Retrieved 7 March 2019. ^ "'Kalank' poster: Heres the first character look of Sanjay Dutt". Times of India. Retrieved 7 March 2019. 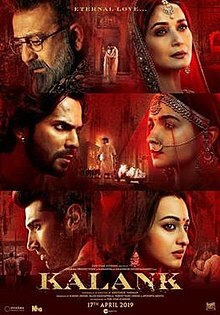 ^ "Kalank Poster: फिल्म से आलिया भट्ट का लुक आया सामने, दुल्हन बनी ऐसी आ रही हैं नज़र" (in Hindi). India Tv News. Retrieved 8 March 2019. ^ "Pure, elegant and filled with love: Sonakshi Sinha as Satya Chaudhry in Kalank is beautiful beyond words". Times Now News. Retrieved 8 March 2019. ^ "Kalank character poster: Madhuri Dixit's Bahaar Begum slays with her expression". Indian Express. Retrieved 8 March 2019. ^ "Kalank teaser release Karan Johar takes a leaf out of Sanjay Leela Bhansali's book". The Indian Express. Retrieved 12 March 2019. ^ "Alia Bhatt, Varun Dhawan`s eternal love story leaves a lasting impact in Kalank teaser!". Zee Bews. Retrieved 12 March 2019. ^ "Kalank Official Teaser| Varun| Aditya - Alia -Sanjay - Madhuri - Sonakshi". FoxStarHindi on YouTube. ^ "Kalank - Official Trailer - Varun Dhawan - Aditya Roy Kapur - Sanjay Dutt - Alia Bhatt - Sonakshi Sinha - Madhuri Dixit- Abhishek Varman". YouTube. FoxStarHindi. Retrieved 3 April 2019. ^ Rhode, Shruti (3 April 2019). "Kalank: Here's everything that happened at the trailer launch of Karan Johar's period drama". Times Now News. Retrieved 3 April 2019. ^ "'Tabah Ho Gaye': Madhuri Dixit dances to heartbreak song in 'Kalank'". Times of India. Retrieved 11 April 2019. ^ "Madhuri Dixit mesmerises fans with her performance in 'Tabah Ho Gaye' song from 'Kalank'". Times of India. Retrieved 11 April 2019. ^ "Kalank song Aira Gaira: Varun Dhawan, Aditya Roy Kapur woo a seductive Kriti Sanon". Hindustan Times. Retrieved 13 April 2019. ^ "Photos: Karan Johar, Shweta Bachchan and others attend a special screening of 'Kalank'". Times of India. 15 April 2019. Retrieved 16 April 2019. ^ Taran Adarsh [@taran_adarsh] (16 April 2019). "#CensorNews: #Kalank certified 12A by British censors on 12 April 2019. Approved run time: 165 min, 34 sec [2 hours, 45 minutes, 34 seconds]. #UK #Kalank certified M by Australian censors on 15 April 2019. Approved run time: 166 min [2 hours, 46 minutes]. #Australia" (Tweet) – via Twitter. ^ a b Sen, Raja. "Kalank movie review: Varun Dhawan, Alia Bhatt, Madhuri Dixit shine in a stunning but soulless film". Hindustan Times. Retrieved 17 April 2019. ^ Gupta, Rachit (17 April 2019). "Kalank Movie Review". Times of India. Retrieved 17 April 2019. ^ Taran Adarsh [@taran_adarsh] (17 April 2019). "#OneWordReview… #Kalank: DISAPPOINTING. Rating:⭐️⭐️ Doesn't live up to the expectations... Writing, music, length play spoilsport... Few dramatic portions work... Second half engaging in parts... Good climax... Varun, Alia, Madhuri, Aditya, Kunal Kemmu top notch. #KalankReview t.co/rJgyNi3Ain" (Tweet) – via Twitter. ^ Chatterjee, Saibal. "Kalank Movie Review: Stunning Alia Bhatt And Luminous Madhuri Dixit Make Film Near-Spotless". NDTV. Retrieved 17 April 2019. ^ Gupta, Shubhra. "Kalank review: All show and no go". The Indian Express. Retrieved 17 April 2019. ^ Ramnath, Nandini. "'Kalank' movie review: An attempt to map a love triangle onto the tragedy of the Partition goes awry". Scroll.in. ^ Chopra, Anupama. "Kalank Movie Review: The Artificiality Works Because The Emotions Feel Real". Film Companion. Retrieved 18 April 2019. ^ Taran Adarsh [@taran_adarsh] (18 April 2019). "Top *Opening Day* biz - 2019... 1. #Kalank ₹ 21.60 cr [Wed] 2. #Kesari ₹ 21.06 cr [Thu] 3. #GullyBoy ₹ 19.40 cr [Thu] 4. #TotalDhamaal ₹ 16.50 cr Note: Hindi films. ₹ 10 cr+ openers included in the list. India biz. #Kalank is the biggest opener of Varun and Alia to date" (Tweet) – via Twitter. This page was last edited on 22 April 2019, at 07:57 (UTC).